Why GFSI? And How Can It Help? Regardless of where you are in your Global Food Safety Initiative (GFSI) journey – at the starting line, just taking your first steps, or at the finish line – do you know WHY you are on the path you’re on? What is all the fuss over GFSI is about? The Global Food Safety Initiative or GFSI, simply explained, is a business-to-business Food Safety and Modernization Act (FSMA). It operates quietly and privately within the marketplace between the customers and their suppliers. It operates on not only a global basis, but also on a regional and local basis. “Although people look at the [GFSI] program and see a lot of multinational corporate logos, frankly the majority of our operations are small and medium size facilities at the local level. So we welcome facilities of all natures – large, medium, and small, across the food to fork continuum,” Karil Kochenderfer, North American representative, GFSI, said during a recent webinar. Catering, equipment manufacturing, food safety services – 2015. Where are these guidances coming from? How can you be sure that these guidelines are science-based, risk-based, and address the issues in your plant/facility? At the very base of our efforts that are ensconced within these guidance on a sector by sector basis, are the international standards of science based within the Codex Standard on Food Hygiene. On top of that are Hazard Analysis and Critical Control Points or HACCP standards. Above HACCP are National Regulations, which includes FSMA in the U.S. and the Safe Food for Canadians Act in Canada. In Europe it’s something different, in Japan it’s something different, but all have iterative levels of science-based regulation in place to ensure the safest control of the food and management of the food. 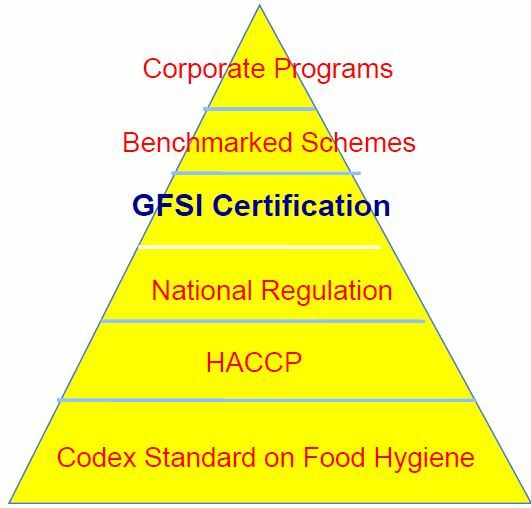 Above National Regulation is GFSI Certification. “We go above and beyond the science of Codex, HACCP, and national regulation to perform at the highest level of industry. And our benchmarked schemes [eg. BRC Global Standards (BRC), Food Safety System Certification (FSSC 22000), International Featured Standards (IFS)] go beyond us and corporate programs go even further,” Kochenderfer highlighted.So what you have are several layers of protection that will help protect both consumers and companies. What are some of the shared benefits for industry? Gain cost efficiencies throughout the supply chain. “We have now built confidence in third-party certification because we have reduced inefficiency in the food system. Now, it’s ‘Once Certified, Accepted Everywhere,'” stated Kochenderfer. Right now, only a third of the industry has achieved GFSI certification, which leaves the remaining two-thirds either still at the starting line or just a few steps into their journey. How do you choose a GFSI-recognized scheme and get started? Karil Kochenderfer shared a chart to allow users to see where they fall on the farm-to-fork continuum and further determine which scheme(s) would work for them. Further, we have developed four GFSI checklists for the four major schemes that apply to food manufacturers, co-produced with the respective scheme owners to ensure accuracy and usability. The checklists are complimentary and may serve as a great resource on your journey toward GFSI certification.